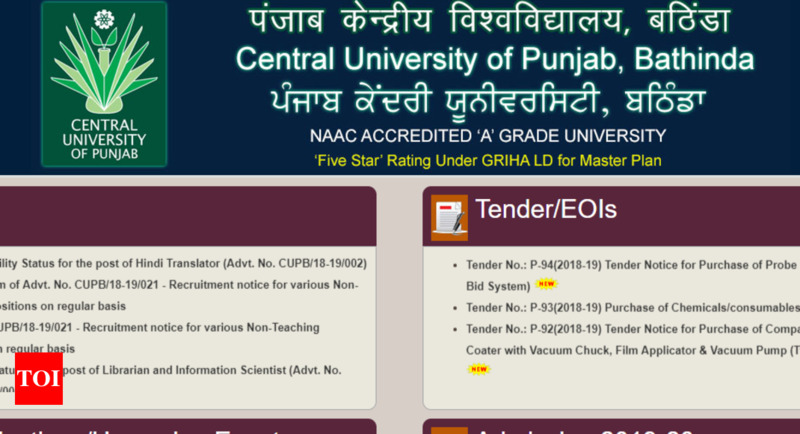 Bathinda: The last date to apply online in various Post Graduate and Doctoral programmes of the Central University of Punjab through Central Universities Common Entrance Test (CUCET) got extended till April, 20, 2019. Earlier it was to be applied till April 13. University controller of examinations Kanwal Pal Singh stated the last date to apply through CUCET 2019 has been extended from April 13 to 20. He asserted that the large number of students have already applied online to appear in CUCET 2019 but, it seems some students have not completed their online application submission process due to which CUCET authorities extended the last date to apply online. The entrance will be organized on May 25, 26. In 2019-20 academic session, CUP Bathinda is inviting online applications in 42 Master Level and 30 PhD Programmes. Authorities stated that students can visit University’s Official website www.cup.edu.in and check details of various programmes provided under its various schools such as Basic & Applied Sciences, Education, Engineering & Technology, Environmental & Earth Sciences, Global Relations, Health Sciences, Language Literature & Culture, Legal Studies & Governance, Social Sciences, Management and Information & Communication Sciences in different subjects such as Law, Education, English, Hindi, Punjabi, History, Geography, Geology, Sociology, Life Sciences, Chemical Sciences, Pharmaceutical Sciences,, Chemistry, Mathematics, Physics, Statistics, Environmental Science & Technology, Food Science, Agri-business Management, Computer Science & Technology, Commerce, Economics, Pharmacology, Physical Education, Fine Arts, Performing Arts, Journalism & Mass Communication, Library and Information Sciences and Psychology.